SLA6-B Automatic stretch PET bottle blow moulding machine, with high performance rate of 6000BPH for 500ml PET, also suit for blowing any bottle sizes from 50ml to 2,000ml PET bottles. It adopts special innovative unique technology by combining the heating tunnel and blowing system into one unit, that greatly shorten the time of bottle molding production, and blowing quality and output capacity are sharply speeded up than ever. Moreover, the potential damage to the blowing machine is also greatly decreased to keep a endurable service life for this blowing machine, also greatly increase the security of operation for the user. With smoothly and steadily performance, the machine becomes very popular in bottle molding industry. This bottle blow moulding machine adopts special preform uploading system with patented preform feeding technology, which includes two sets of preform conveying system, linear feeder and preform inverse feeder. The linear one move preforms up to preform holder, along with conveyor chain by holding the preform neck, after enough preheating in the heating tunnel, the inverse feeder grips these heated preforms , turnover 180 degree with the neck, and feed into the blowing system for bottle blowing process. 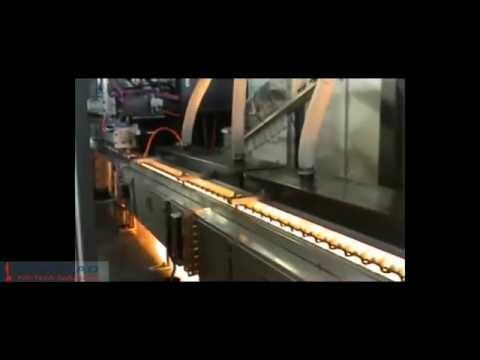 After stretching and blowing, bottles are taken off by inverse system and feed out along the conveyor belt. With this special PET preform loading and unloading system, this machine greatly avoid any potential damages to preforms and bottle in the whole bottle making production. Bottle blow molder is fully controlled with PLC controlling system. There is no second time pollution to the bottles and preforms, nor labor waste, because the complete operation can be done completely with PLC controller. This machine includes three main systems: PET preform loading system, PET preform preheating system, and PET preform blowing system. •Feeding system carries the preforms by robot arms automatically. •This full automatic PET bottle blow molding machine is suitable for producing PET plastic containers and bottles in all shapes. •Fully automatic process with low investment, high efficiency, quick and safe for operation, easy for maintenance. •with reasonable high efficient design, full automatic controlling, save power and labor. •Infrared oven heater adopts the quartz lamp to heat the PET tube. Step1. Load the PET preform into preform hopper and the conveyer will take the preform to sorting system automatically. Step2. Load the PET preform with the neck upto PET preform holder, and then preform is delivered into heating tunnel. Step3. After heating, preform is conveyed into the blow system, then moulds closes, stretches and blows under low pressure and high pressure, exhausting, and opens the mold. Step4. The finished bottle is taken off by automatic unloading system.